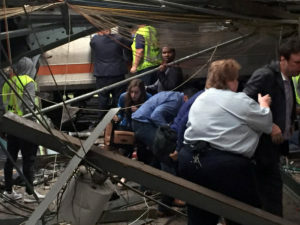 In the wake of a deadly commuter train crash in a busy Hoboken, New Jersey train station, New Jersey Transit has approved a budget that includes funding for large parts of positive train control (PTC) system, which would include an automatic braking system that could automatically stop a train in an emergency situation. New Jersey Transit approved an agreement for leasing radio frequency spectrum, which is an essential part of a PTC system, to cover northern and eastern areas of the railroad in the state. In April, the transit authority worked out a deal to cover the southern, central and western areas. NJ Transit has until the end of 2018 to fully implement PTC, per the federal deadline for the installation of PTC on all commuter train systems. When the commuter train in Hoboken crashed, killing one and leaving 100 injured, the NTSB quickly concluded that an automatic braking system may have prevented the disaster. In that crash in late September 2016, the commuter train was rolling into the Hoboken station at a normal 5 MPH, but suddenly increased speed and crashed into the terminal, spraying debris through the waiting crowds of commuters. It is not yet known why the train sped up; the engineer has no memory of the crash. When a train derailed in Philidelphia in May 2015, the NTSB also determined quickly that the derailment would have been prevented by PTC. Our railroad accident and railroad derailment lawyers are glad that New Jersey Transit is working on installing PTC on its trains and rail lines. PTC could prevent 52 accidents per year, according to the Federal Railroad Administration. The NTSB also claims that if PTC had been in place, it could have prevented 15 train crashes since 2005 that killed 50 people. Our personal injury attorneys implore the US and state governments to implement Positive Train Control more quickly. We should be keeping up with countries in Europe and Asia that already have versions of PTC in place. When train derailments occur, the injuries and deaths are devastating to families. And those derailments can lead to huge personal injury and wrongful death lawsuits that can cost the railroad tens of millions of dollars in a jury verdict. PTC is a smart investment. A deadly train crash in New Jersey on Sept. 29 that killed one and injured more than 100 underwent a rapid acceleration just before impact as it entered a busy commuter station in Hoboken NJ, according to the NTSB. The NTSP stated that the train was rolling into the station at a normal eight MPH, but for some reason, about 30 seconds before the crash, it sped up to at least 25 MPH. The engineer working the train stated that the brakes were operating normally. The emergency brakes were applied one second before impact. The NTSB will continue to review the deadly crash and will make safety recommendations to avoid a recurrence. That could take more than a year. The engineer told investigators that he was not using his cell phone and that the brakes had been checked before the trip. He claims no memory of the crash and remembers waking up on the floor of the cab. There is speculation that the engineer fell asleep, but the investigation is continuing. Our personal injury and railroad accident attorneys hope that this railroad crash in New Jersey will speed the adoption of positive train control or PTC throughout the commuter rail industry. The technology exists now to automatically slow trains that do not stop as they should, or are running well beyond speed limits for given area, but there continues to be delays in implementing this system throughout the country. With PTC on line, this would prevent many train accidents from occurring, as well as serioius injuries and loss of life that leads to expensive lawsuits. A long Island Railroad work train sideswiped a New York passenger train on the evening of Oct. 8, injuring 30. While there were no life threatening injuries reported, Nassau County Executive Ed Mangano did stated that some of the injuries included broken bones and concussions. The passenger train involved in the railroad crash was the train that leaves at 8:22 from Penn Station in New York. The rail accident happened after 9 PM. The crash caused the first three cars of the passenger train to derail. Mangano said the crash happened near a switch, but is was unclear if a switch malfunction led to the crash and derailment. Our railroad injury personal injury attorneys based in Virginia are relieved that there were apparently no life threatening injuries in this train crash. However, there were serious personal injuries reported and we hope all of the injured passengers recover. As personal injury lawyers who have won record-setting verdicts in train derailment cases, there are far too many train accidents across America that occur due to lapses in safety. Earlier this month, a serious commuter train crash occurred at a busy station in New Jersey, killing one and injuring more than 100. Human errors usually have something to do with the cause of serious railroad accidents and train collisions. Nonetheless, the railroads are seeking to downsize train crews on commuter railroad crews to a single engineer or operator but the leaves no fail safe if that person is distracted, falls asleep, or otherwise fails to act appropriately with regard to safety. A slightly less effective fail safe is positive train control that will automatically stop a train under certain circumstances but the railroads of course have to delayed implementation and tried to water down implementation to less than 100% of the railroad or commuter lines in the nation. The public need not wonder whether positive train control would have made a difference in many of the major railroad and commuter line accidents and tragedies that happened in the last several years. In both of the train crashes, it appears that safety issues led to serious accidents. One important safety feature that could prevent some collisions and derailments is Postive Train Control or PTC. This system is based on GPS technology and would automatically stop a train if a collision were imminent. Railroads lobbied Congress to push back the date to install PTC on all commuter trains until 2018. That’s too bad, because it is possible that these two serious train crashes may have been avoided with better safety techology in place. A Halifax PA railroad crossing where a woman was killed in a train accident on Labor Day is only marked by faded crossbuck signs. The community is asking if there should have been flashing lights and additional warnings installed at the deadly railroad crossing. The woman, Trisha Hoffman, 29, died instantly on Sept. 5 when her car was hit near Route 147. Back in 1978, engineers testified about the proposed railroad crossing and said that the crossing should have flashing lights and other safety measures. Also, in the 1980s, a civil engineer with the railroad company recommended flashing lights at the crossing to counteract a wooded area that blocked the drivers’ view of approaching trains. However, the PA government rejected the $60,000 flashing lights as too expensive. Instead, the government was supposed to clear the trees and brush 1000 feet north and south of the crossing. The trees and brush were cleared but they grew back in the 1980s. Now the trees and brush hug the tracks and severely limit driver visibility. 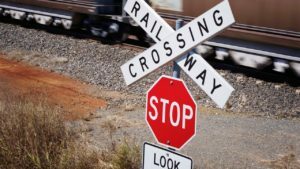 Our railroad crossing accident attorneys in Virginia see too many railroad crossing accidents that end in death or serious personal injury. One of the most common reasons for deadly railroad crossing accidents is that the crossing is not maintained properly. It is very important for proper sight lines to be maintained so that drivers can see approaching trains. This PA railroad crossing sounds as if there is far too much brush and trees hugging the tracks and this reduce visibility to the point that the woman could not see the train barreling towards her. 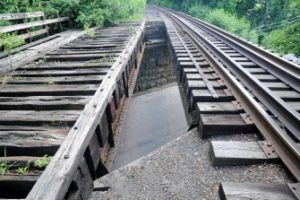 The article does not mention the railroad that uses that track, but it is the railroad’s responsibility in most cases to keep the brush and trees clear of the tracks. The woman’s loved ones should consult with a personal injury attorney experienced in railroad accident wrongful death cases.This woman had a long life in front of her, and her family should receive compensation for their pain and suffering and also for decades of lost wages that she would have earned if she had lived a normal life span.